The scene at 11:30 p.m. on Oct. 9 from Toronto, Canada just before the event begins. The view will be different from any given location. 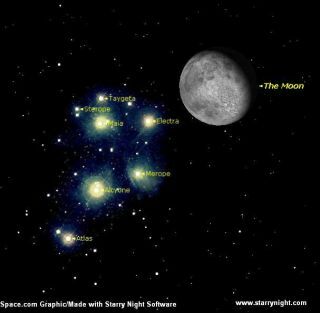 On the night of Oct. 9-10, a waning gibbous Moon will cut straight across the Pleiades Star Cluster. This event will be visible across much of North and Central America. This event is known as an occultation; the light of a star appears to vanish instantaneously behind the edge of the Moon and reappears from behind the Moon a short while later with similar suddenness. So far, in 2006, the Pleiades have been occulted in every month. For North Americans, the best occultations came on the evening of April 1 and during the early morning of July 20, when a slender crescent Moon crossed in front of the "Seven Sisters." But on the night of Oct. 9-10, the Moon will be 87 percent illuminated, so it will be much brighter and will make this upcoming occultation much more difficult to see. As the Moon moves along in its orbit, stars will disappear behind the Moon's bright side first. This means that if you're hoping to see a star wink-out, you're going to need a good telescope in order to follow that star all the way to the edge of the Moon's bright limb. On the other hand, stars will reappear along the Moon's dark (unilluminated) limb, so they should be more easily visible as they should suddenly appear to "pop-on" from behind the Moon's disk. Depending on where you are located, the view of the occultation will differ, as well as the time of the night. For the Canadian Maritimes and Northeast U.S., only three of the seven brightest Pleiads - Electra, Taygeta and Maia - will undergo an occultation. These events will happen in the middle of the night, as Oct. 9 transitions to Oct. 10. In contrast, over the Southwestern U.S., up to five Pleiads - Electra, Merope, Alcyone, Pleione and either Maia or Atlas - will be occulted; these events occurring during the more convenient mid-to-late evening hours of Oct. 9. In the two tables presented below, I have calculated times for 18 selected cities, for when the seven brightest Pleiads will appear to disappear behind the Moon, then later, reappear. Times are all in local daylight time (except for Tucson, which observes standard time). Remember that those times listed as p.m. are for the calendar date of Oct. 9, while those listings in a.m. are for the calendar date of Oct. 10. A dashed line indicates that a particular star escapes being occulted by the Moon. For Montreal, Monterrey, Winnipeg and Los Angeles, a "G" follows the times listed either for Taygeta or Atlas. This indicates that from these locations, the selected star will appear to graze exceptionally close to the limb of the Moon and depending on your location in these metropolitan areas, the star may or may not end up being hidden by the Moon. If you are north of Monterrey and Los Angeles, you will see an occultation; south of these cities will probably result in a near miss. Conversely, if you are south of Montreal and Winnipeg, you will be within the zone of seeing an occultation, while areas just to the north will see the Moon's edge barely miss covering the star. Another possibility is being placed fortuitously near or on the narrow graze line, in which case you would see the star disappear and reappear behind lunar mountains and valleys as the Moon slowly glides by. The next Pleiades occultation that will be visible from North America (and also for Europe) comes on the night of December 3-4. Unfortunately, the Moon will turn full during that night, making prospective viewing all the more difficult.